The European Space Agency's fourth Automated Transfer Vehicle broke apart above the Pacific Ocean during a planned re-entry on Nov. 2, 2013. The uncrewed cargo ship is designed to break apart in Earth's atmosphere after completing its mission on the International Space Station. A stunning video shows the destruction of a robotic cargo ship re-entering Earth's atmosphere in November after delivering 7 tons of supplies to the International Space Station. The sequence of pictures shows the European Space Agency's Automated Transfer Vehicle (ATV) named for Albert Einstein burning up over an unpopulated area of the Pacific Ocean. 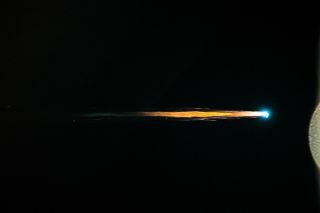 The amazing ATV re-entry video, which ESA unveiled last week, shows the colorful breaking apart of the vehicle as it entered Earth's atmosphere on Nov. 2, 2013. The ship carried about 1.7 tons of waste from the station. Europe constructed and launched five ATVs to the station as part of its international agreement with NASA and other agencies. The last one, named for the physicist Georges Lemaitre, is currently docked to the space station and being loaded with trash. Space station crewmember Samantha Christoforetti is expected to install an infrared camera in the spacecraft before it leaves the station Feb. 27. "The battery-powered camera will be trained on the Automated Transfer Vehicle's forward hatch, and will record the shifting temperatures of the scene before it," Neil Murray, who oversees the camera project for ESA, said in a statement. "Recording at 10 frames per second, it should show us the last 10 seconds or so of the ATV. We don't know exactly what we might see – might there be gradual deformations appearing as the spacecraft comes under strain, or will everything come apart extremely quickly?" While Europe's ATV series has run its course, the International Space Station still has many options for cargo vehicles. The private companies SpaceX and Orbital Sciences Corp. each have vehicles that make periodic runs to the station. Orbital's Cygnus spacecraft is temporarily sidelined following a rocket explosion last year. SpaceX's Dragon spacecraft is also being developed as a crew vehicle, which may fly as early as 2017. Most cargo runs to the space station are done using the Russian Progress spacecraft. Japanese Kounotori ships (also called HTV spacecraft) also journey to the station on robotic supply missions.